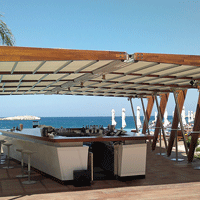 The awning market has embraced the modern aesthetic with a rise in fresh, inventive stylings. See below for exciting, new varieties in sun shade solutions. Equipped with cutting-edge features, these outdoor fabrics offer benefits like water resistance and maintenance-free topcoats. The canvas fabrics are offered by the yard in durable materials—like acrylic, vinyl, and high-tenacity polyester. Ideal applications include commercial awnings, residential canopies, pergolas, shade sails, RV awnings, and other shade structures. Choose from a range of high-depth textures, versatile neutrals, and bright colors from leading brands. At Trivantage, we make an effort to offer the smartest fabrics to fulfill your toughest fabrication demands. Shop the latest in wholesale canopy fabric below or check out the rest of our awning fabric. For additional info on warranties, how to clean, and more, head over to our Resource Center. Like its name suggests, Weathertyte Plus is built to face the elements. 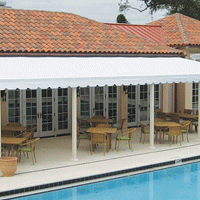 The unique awning fabric combines protective features with a sleek look and hand. 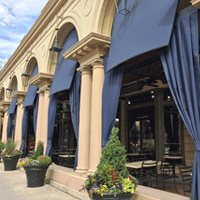 While perfect for awnings, the canvas material can also be used in a number of canopy, sun shade, and banner applications. Weathertyte Plus Lite affords the same advantages with a lighter weight. 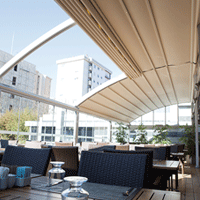 Herculite Natura is ideal for awning applications in outdoor seating areas and other customer-facing venues where style is key. The carefree material repels water, flame, and stains. It’s also dimensionally stable to resist stretching and warping. Dickson Arcade FR fabrics are equipped with a blend of high-grade features. The PVC-coated polyester is protected by the Lowick System for longevity and Cleangard® for lasting cleanliness. Excellent UV capacity and lightweight construction mean it’s great for tents, awnings, and other shade structures. Dickson’s LAC 650 SL series is made from flame-retardant, PVC-coated polyester. Flexible yet durable, the fabric works great for awnings, interior and exterior banners, wall hangings, and more. The high-tenacity canvas material delivers many of the same benefits you expect from Dickson.